Vinyl siding is engineered for quick and easy installation. Lightweight, trouble-free handling, and simple to cut. Everyone from certified pros to confident DIYers rely on vinyl siding for beautiful results that last a lifetime. 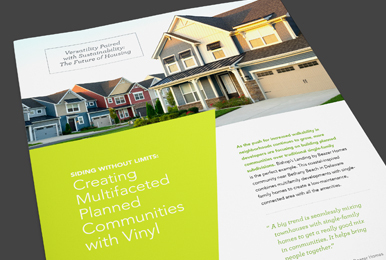 Refresh your vinyl siding installation insight with the latest best practices in our comprehensive guide. Review the most recent techniques including vinyl siding repair, cleaning, maintenance, historic restoration tips, and recycling leftover scrap. Get quick, at-a-glance answers to all your vinyl siding questions with our installation tips and tricks. From overall guidance on how to complete a successful job to specific instructions on how to install soffit, we have the references you need to safely and accurately install vinyl siding. VSI trains and certifies professionals on proper vinyl siding installation techniques. Our certification program helps improve end results to minimize issues and callbacks. Homeowners rely on VSI Certified Installers to complete their projects to the highest industry standard.